Heading to the beach over the Christmas holidays is as Kiwi as Wattie's Tomato Sauce, hokey pokey ice-cream and jandals. 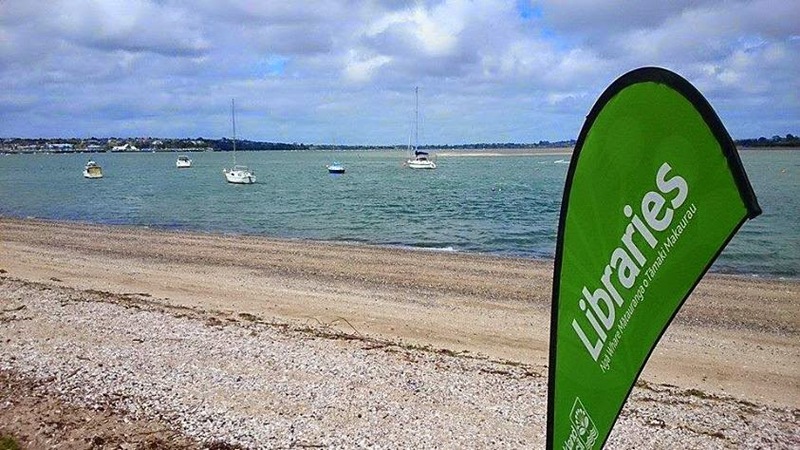 And with many beach-goers looking to relax there with a book or magazine, it was a natural fit for Auckland Libraries to hit the beach last summer! With a fleet of four mobile libraries usually parked up during this period, Kumeu Community Library Manager Matthew Kerr, who had been working on a project to look at peoples' experience of using mobile libraries, saw an exciting opportunity to connect with and delight customers in an unexpected way. "Summer is the one time of the year when mobile libraries are off the road. They normally get a service and thorough revamp over the Christmas and New Year period. This year we were able to get this work done fast and early, which enabled the buses to be available for something else. I really wanted to be able to show up to a spot where lots of people went over summer and surprise them by providing a full service pop-up library." From this idea, the #ALBeachBus was born, and the response from local media and the public exceeded Matthew and his team's wildest expectations. "Not only did big numbers of customers come in and visit us on the buses, staff were holding more than one storytime per hour, and helping at least one person with an in-depth technology question every hour. We also gave away more than 1800 books to beachgoers - these withdrawn books were given a new lease of life in people's homes, and the most popular of these were the children’s and teenager books. It sounds funny in retrospect, but popularity of these the free books was the biggest surprise for us," Matthew said. As this was the first time such a venture had been trialled, problem-solving happened on the job, and as Matthew explains, there were some interesting and unforeseen situations. "Working on beaches has unique challenges – when the weather changes you need to be prepared to get out of the wind. So we learned to make adjustments. We also learned that even though all the staff who worked on the day were vivacious ambassadors for reading, being in the sun and out in the public eye can really make you exhausted quickly. We had to learn our limits and ensure adequate rest." Another thing that we learned happened entirely by accident. For a lot of parents visiting fixed libraries, taking the kids is just one more on the list of things to do during the day. It is more common to hear a parent calling their child to get going and leave the library than it is to hear of a child who is bored and begging their parent to leave the building. This seldom happened at the beaches, and most of the time, families were at the beach for hours. Children felt free to come and go in the pop-up library space as frequently as they liked, without the pressure of time," Matthew says. "Parents were more relaxed about their children spending as long a time as they needed being read to or lying on the beanbags reading to themselves, colouring in, or chatting to a librarian. There was less pressure to grab stuff and go, and more chance to enjoy being literate. As libraries, we need to ensure that we try to help customers find their relaxation space in order to enjoy reading. This needs to be done regardless of whether we are serving people in a branch library or in a pop-up library," he continues. 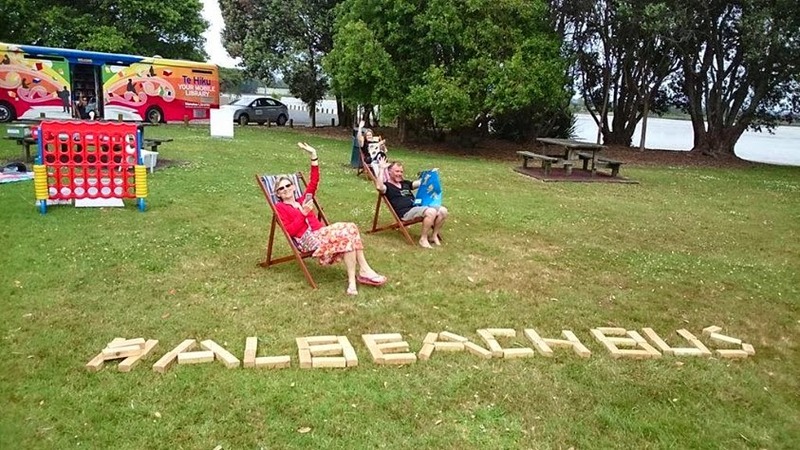 As well as a way to surprise and delight customers, the #ALBeachBus project strongly linked with Auckland Libraries' strategic directions to connect with new customers through targeted community outreach as well as looking at exploring creating new and engaging library spaces. Auckland Libraries’ mobile buses are roaming libraries that travel throughout the region. Our ‘book buses’, as they’re sometimes called, carry a range of books, magazines, audiobooks, and other items that would suit customers of all ages. They're especially helpful for those who may find it challenging to visit a library branch. Find timetables for our mobile library services on the Auckland Libraries website.